Compare files, folders and sub-folders to quickly update backups… It will list you the changes between two media, presenting you the Missing files, those that are Newer and those that are Duplicate from both media selected. You can select which files to copy over to the other media, or copy them all in one go. The Missing Files, Newer Files, Duplicate Files and File Browser tabs will quickly show you where you’re at. You can then make new copies or update old ones to keep valuable files safely out of harms way in a backup folder, or to transport current files to another location on a disk or laptop computer, and even over a network and the Internet. And in any folder of temporary files you’ll see clearly which ones are duplicates that can be cleared away. There are more than one way to synchronize files. 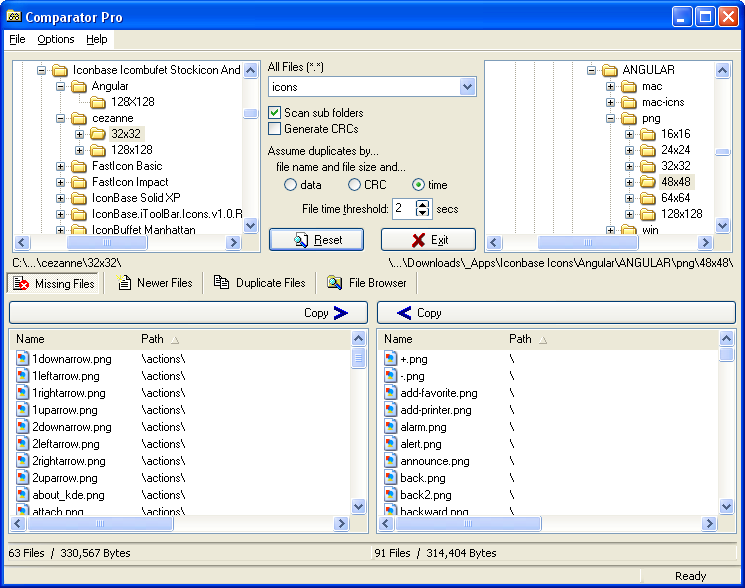 Unlike other software, Comparator let you select how files are compared, and where to look for files. Simply comparing files by date may not be good enough for accurate synchronization. The option to compare files by content assure 100% accuracy. Between PC with different version of Windows, time is not always as accurate as you might think. If you synchronize files between a Win98 and an XP machine, you’ll find that there is a difference of up to 2 seconds in the file time. Comparator provide a time threshold adjustment for this purpose to assure proper synchronization. 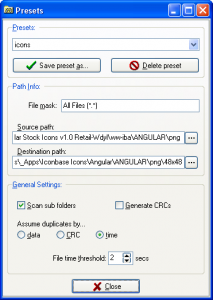 Let you scan for files not only in the selected folder, but including all of its sub folders. This is very important to synchronize or backup an entire folder, or drive. CRC: CRC is an option that will calculate the CRC (cyclic redundancy check) to be used in data comparison, or for your own use. Comparing files by CRC is 99% accurate and some prefer this method for speed over the slower method of full data comparison. 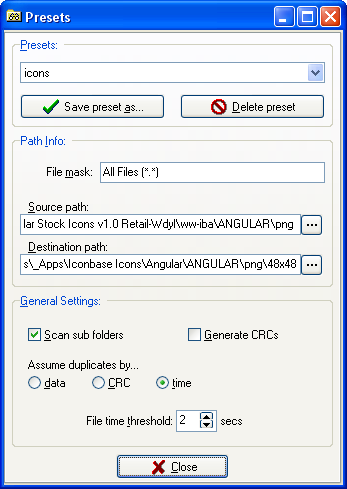 Presets is a must for fast synchronization of multiple source and destination. You simply give a preset a name or title, set the source and destination along with the settings, such as the type of files and comparison method. Then select this preset for instant setting recall and start the synchronization. This eliminate the need to always select the source and destination with the settings to use for this job. 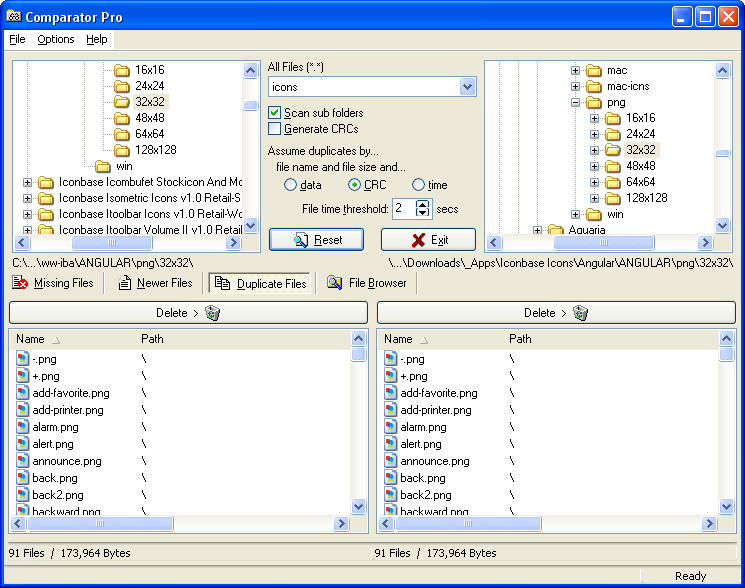 Comparator synchronize your files between PCs, backups or any removable media such as CD-RW, Flash, ZIP/JAZ drives etc. Synchronizing files is something of importance to keep your data files up to date, for example, office to home, or office to laptop. But it does not end here. Use it to backup your files without the need to copy everything all over again. ComparatorPro will only copy files that have changed or that do not exist on the destination media, keeping the full directory structure. Safe? 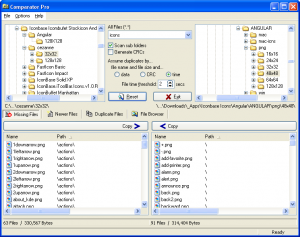 : ComparatorPro does much more to keep your files safe, such as detecting duplicate files. For example, if your backup from this morning does not contain duplicate files from tonight, and you have made no changes (or only a few) to your files, it is clear that something is wrong. Maybe a virus, or simple data corruption. Now is the chance to restore from your backup, rather then updating your backup with corrupted data!. Why? : Not only the professional can benefit from ComparatorPro, but everyone will, even if you only own one PC. Lets say, the professional will backup his files to his laptop and bring his work home, or in the plane while traveling. Changes to his files while not at the office can be updated quickly and easily when he return to the office. You can imagine the possibilities here. Backing up your files is a must, but it doesn’t have to be hard, such as using a complicated backup tool that will do only one function, and work only with one kind of media. ComparatorPro is 100% Network Compatible. Multi-language (UNICODE) interface:: You can run ComparatorPro in multi-language interface, all dialog texts and messages. Create your own language by editing the language file directly. Shareware license: 30 days free trial. Owner license: $39.95 USD, include unlimited free updates and priority support.